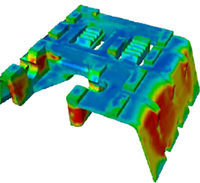 Digimat was used to model the plastic injection of a sun roof bearing part, taking into account fiber orientations predicted by injection molding. There existed very good correlation with experimental failure data. Digimat was able to predict critical failure location in the part.